how to convert Delphi code segment to C++Builder. Delphi to C++ Builder can’t substitute for your handcraft modification completely, but can save 80% time for you! Improvements of Delphi to C++ Builder V1.5 1, Get rid of some BUGs within first version, make better convert result. 2, Distinguish the contents which shouldn’t convert such as the string, annotation…etc. and prevent from the breakage in converting. This is a tools that convert Delphi code segment to C++Builder,it can carry out a majority of syntax conversions very simply! (The code in the function or procedure ,from “VAR” to last “EDN” ) this is a programer’s assistant. Code to FlowChart is widely used in software development and project documentation. It can help software engineers or document writers to generate source code flowchart automatically. It is popular for the converting speed and elegant charts. Without any manual drawing skill is required, Code to FlowChart can help you to create the flowchart effortlessly. When you get a piece of open source, Code to FlowChart can show you whether the open source is what you need. The flowchart is printable in Code to FlowChart program. Code to FlowChart is composed of three parts: Code Tree, Source Code and Chart. All the parts can be shrunk or dragged to other place as you wish. Code Tree is used for showing the basic structure of project. All the key nodes will be displayed as a branch in this tab. Source Code is used for showing the source code. Chart is used for showing code flowchart of the project. You would be able to shrink or expand the full flowchart here by clicks on the boxes. The flowchart will show you how the project works. If you want to use open source in your project, or you want to learn programming with the open source, Code to FlowChart will greatly help. The only thing you need to do is to open the project file in it and it will automatically convert code to flowchart. Code to FlowChart V2.0 Supports to open C/VC/VC++/Pascal/Delphi/PHP project files and generates the elegant flowchart or NS chart in MS Word/Visio/SVG/BMP/XML formats. It also supports to print the full flowchart directly as you need. The box of flowchart is editable too in MS Word and Visio files. Code to FlowChart is a professional project management tool for software engineers. It isn?t a designer which needs to draw the chart manually. It has the most elegant charts among all the similar code to flowchart tools. It is the #1 code to flowchart converter in Google Search. If you are looking for a solution to let code visual, this tool is the best choice we highly recommend! Code to FlowChart is widely used in software development and project documentation. 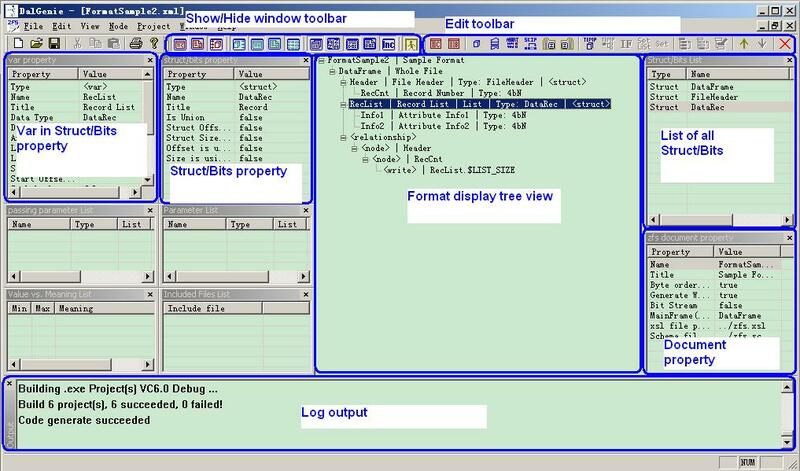 It can help software developer or document writer to convert source code to flow charts automatically. It understands and improves your algorithms on software developing. By using Code to FlowChart, you can easily know the structure of unfamiliar source code. More than that, you can solve some very complex bugs by the flow chart and NS chart. 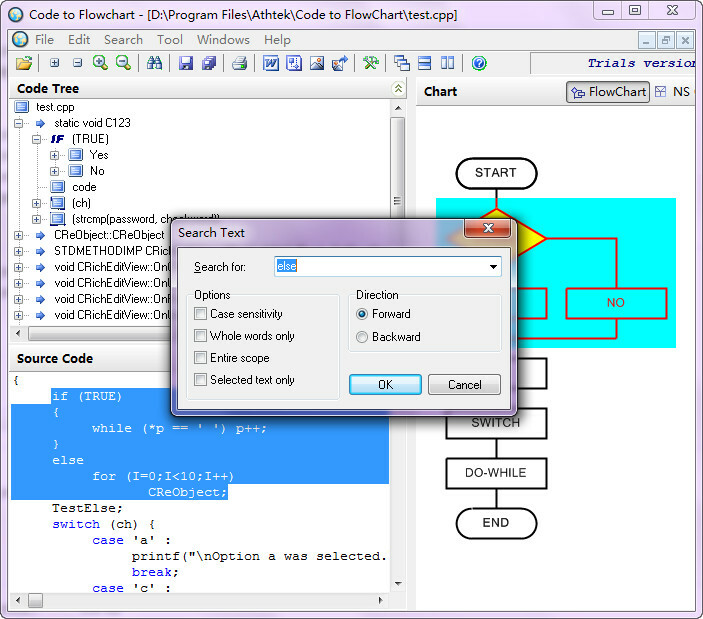 Code to FlowChart is an advanced source code to flowchart converter for software developers. It can automatically generate flow chart/NS chart from source code, and helps users to understand complex program structures by visual diagrams. Code to FlowChart reverse engineers your source code into high-quality flow charts or UML Activity Diagrams. Code to FlowChart analyzes programming statements, loops, to build up a flowchart from the source code. The Flowchart is based on the imported programming project files. Double click on the logical boxes, the flowchart will be fully shrunk or expanded as you like. Especially, Code to FlowChart allows generating flowchart from source code segment. This is very useful in locating logical errors or extra codes when the user is verifying a huge amount of source codes. No manual drawing is required. Code to FlowChart is a helpful programming assistant in many practical works. It supports C, C++, VC++ and Pascal/Delphi. You can easily add flow charts to your project documentation by using Code to FlowChart. All Charts can be exported to MS Word, VISIO, Bitmap and SVG files. Click any logical block on the flowchart, the corresponding source code will be highlighted. This is very useful for document writers. By using Code to FlowChart, programmers are free to get project overview, browsing and navigation. It is a handy assistant for both senior and junior programmers. In one word, Code to FlowChart is the first choice for you to let code visual!